Nichiren Shonin founded Honmonji Temple (one of the official designations, or Sango, is Choeizan or “ever-flourishing mountain”) just before his death in October of 1282 at the request of Ikegami Munenaka, a wealthy feudal lord and faithful follower. Ikegami Munenaka provided 69,384 tsubo of land (51.89 acres). This number corresponds to the number of Chinese characters in the Lotus Sutra. 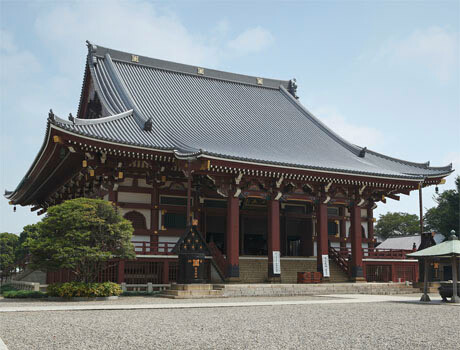 On April 15, 1945, the temple was subjected to heavy bombing, resulting in the destruction of all the structures except the main gate, the five-story pagoda, the Kyozo (repository of Buddhist scriptures) and the Tahoto (stupa). The Temple was completely reconstructed through contributions from followers throughout the country. Going up the front steps and walking through the Niomon (a gate with two guardian deities), visitors come to the Soshi-do (Founder’s Hall) where a statue of Nichiren Shonin is enshrined. This statue was commissioned by his disciples on the seventh anniversary of his death. Behind the Soshi-do, we find the Honden (Main Hall) where Shakyamuni Buddha and the four Bodhisattvas are enshrined. Behind the Honden is the octagonal Gobyo-sho (Mausoleum), which was built on the occasion of the 700th anniversary of Nichiren Shonin’s death. This is where some of the ashes of Nichiren Shonin are enshrined. It is constructed entirely of Japanese cypress. The five-story pagoda was built in 1608. It stands just inside the Niomon gate to the right. It is 29.4 meters high and has an octagonal beam with a diameter of 41 centimeters running from the second story to the top to balance the structure. 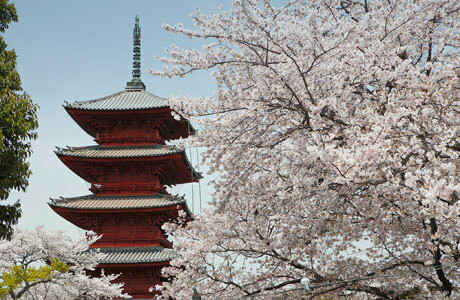 It is constructed to withstand a magnitude seven earthquake and is the oldest five-story pagoda in Tokyo.